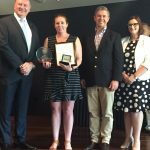 MSS’s Connected Families Team were nominated for Stephen Bromhead’s Community Group of the Year Award and were awarded the title at the ceremony last Saturday. What a fantastic effort from the entire Families Team – they have supported over 500 clients, run a series of events, participated in a range of community days and begun trialling the Men’s Behaviour Change Program. Congratulations!